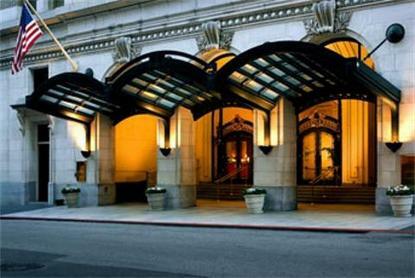 A rich 19th century air of elegance greets you as you walk through the Palace Hotel doors. Beautiful vaulted ceilings and original Austrian crystal chandeliers recreate the glamour of yesteryear. Host to presidents, royalty, and giants of industry, the Palace Hotel, San Francisco is centrally located downtown and adjacent to the Financial District. Our hotel provides distinguished travelers with the excellent service to which they are accustomed, and was named to Cond ast Traveler's 2002 Gold List.Unwind in the Palace Spa with an indulgent massage, body treatment, facial or personalized fitness session. Discover true California cuisine at one of our restaurants and lounges. Our renowned Garden Court restaurant features a beautiful domed ceiling of stained glass and was designated a historic landmark by the city of San Francisco in 1969.Turn-of-the-century grandeur melds with an ideal balance of antiques and ultra-modern amenities in our 518 luxurious guest rooms and 34 lavish suites. In addition, a professional staff is always on hand to deliver the utmost service.